Spa Gift Cards are great for many occasions including: Mothers Day, Fathers Day, Valentines, Birthdays, Christmas, Hanuka, Employees,Charity Auctions, anniversaries, even just to say I love you! 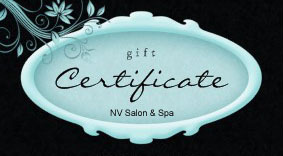 Below you can customize you gift certificate to fit your needs. Gift Certificates can be purchased Online Instantly! We have an abundance of world-class services to choose from and bundled Salon & Spa Packages from $75 to $200. 3. Print / Email Instantly!